When the movers leave and it’s just you and your family in the new home, it can be overwhelming. It’s time to pick a starting point and start tackling, unpacking, and organizing. We hope with these simple suggestions will help you start making your new house into a home. Time to pull out that first night box! Something that might have seemed silly a few weeks ago is now essential. Bottled water, snacks, clean clothes & a tooth brush are simple first steps to making your first night in your house feel like a home. Check out the blog on the first night kit linked here to make sure you have the essentials at your fingertips when they’re needed. Make sure all the essential services are set up. Double check that the appliances that the movers installed work properly. Make sure the electricity works and you have hot water for a shower. If not, call to get these things addressed. Google “Best take out around me” and celebrate! Make the first day in your new home a memorable one – you’ve worked hard to get to this point and you deserve it! Treat yourself to delicious take-out from your new neighborhood and pop a bottle of champagne. After a full move-in day the last thing you will want to do is worry about unpacking boxes to find pots and pans to cook with, or a trip to the grocery store. Make an indoor picnic, open up a moving pad, and dive in to your first meal in your new home. Begin to plan out each room. Because all of the moving boxes are labeled and brought in to the designated rooms it will be easy to attack them one by one. A plan will make the unpacking process less stressful. When you are beginning to get settled, it’s apparent that some rooms take priority over others. A simple bedroom set up is essential in the first few days, some clean sheets and hung up clothes will have you feeling refreshed the next day. Nothing is worse than waking up in a new space with nothing familiar around you. That goes for the kids rooms as well, the sooner they get in to a solid routine in the new home, the better. Plus, if you get the kids set up in their rooms it will keep them preoccupied when you set up the rest of the home. After the bedrooms, we suggest getting the kitchen in order. While you might enjoy some take out for the first few nights, nothing gets you settled in a new house like a home cooked meal. Safety. Safety. Safety. Make sure that all fire alarms are wired correctly and working. Confirm that the home is child proof as needed. If the new home has a pool, make plans to fence it in. Change Locks. It is important to change your locks on your new home because you never know who has copies of the keys. It’s an important safety precaution that can be easily over looked! Schedule a Debris Pick Up. If you find yourself in a pile of empty boxes as you continue to unpack, give Olympia a call to pick up the pieces for you. Also, check out our blog on how to use some of the leftover boxes for the kids entertainment when you unpack! The most important thing to remember is, the small details can wait. Don’t stress to get everything unpacked and organized in one day! It will all get done, and your home will look great. Another year, brings another September 1st and another one of our favorite holidays… Allston Christmas. Allston Christmas is the time when hundreds of thousands of college students move into and out of apartments in the area, leaving their belongings strewn about streets in student-rich sections of the city. According to Urban Dictionary, Allston ‘Christmas’ refers to the bounty of “new” stuff that one can easily acquire free of cost simply by walking down to the sidewalk and running off with it back into your own apartment. Much of the items that are left on the sidewalk are free to take because people can’t fit them into their new apartment or don’t have enough space in the truck to move them. However, many of the items are simply left on the sidewalk temporarily and are rummaged (read: ‘stolen’) by the neighbors in the chaos that is the city of Boston on September 1st. With over 70% of leases ending on September 1st, it’s no surprise to find the city alive with moving trucks and to find discarded belongings on every corner. What is surprising is the types of things you’ll find. This year in honor of Allston Christmas, we at Olympia decided to pair with Flutter to give one lucky winner the gift of a free move. And,while Bridget didn’t have to deal with the stress of heavy lifting during her move, these people weren’t so lucky. You know it’s Christmas when Santa shows up! but an Allston Christmas wouldn’t be the same without an appearance from the BPD… bad Santa. but you still appreciate the holiday’s roots! Allston Christmas is a deep rooted tradition that you won’t soon escape, even if you aren’t living in the area anymore. But most of all, it wouldn’t be Allston Christmas without the fun. If you’re planning a move and you’d like to save yourself some stress, give us a call at 800-222-4744. Dibind is a new online platform where people can list and buy pre-owned furniture in great condition, with the goal of pairing Boston-area college students and young professionals to save money and reduce waste. What really differentiates Dibind from similar sites is that they provide the option to pick up and deliver your purchases! Think of it like Craig’s List, but with a much better interface, curated options, and no hassle of arranging a truck to bring your purchase to your home! The greater Boston area is known for its multitude of colleges and young and vibrant community. Moving is the perfect time to declutter or upgrade our belongings. As millennials frequently move as their leases turn over, they often leave their old furniture on the curb to give away or send to the dump. Alternatively, Dibind is the perfect tool to use when moving in or out of an apartment. With Dibind you can easily post your furniture for sale to clear out your place while making some cash in the process. Another major plus to using Dibind is if the item you enlist isn’t bought with in the time period of your choice, you can choose to have it picked up by Dibind and donated for free – so there’s no risk to trying to make some cash before sending unwanted furniture to the trash! Moving companies like Olympia Moving & Storage love the Dibind concept. We get calls daily from people who are looking to move furniture they bought or sold online, and our service minimums don’t allow us to service those clients affordably. Instead, Olympia Moving is thrilled to recommend Dibind to our clients buying and selling furniture instead! Need a mover to move everything else to your new home? Request a free moving estimate online from Olympia Moving & Storage or call 800.222.4744 to get started. We started by taking a look at trends among the families we moved in our Boston moving company branch in Watertown, MA. Boston-area families seem to be seeking warmer climates, as California, Florida, and Texas are among the top states we moved families to last year. Bostonians also look to move to bigger metro areas in states such as California, Virginia, and New York. The high number of families we move to Virginia might also be influenced by our second location in Alexandria, Virginia. Most Boston-area moves occur in the summer, due to the good weather and the summer school break. The most popular month to move is July, but due to the influence of universities and rental turnovers, the popularity of August moving days is higher than in other parts of the country. Olympia Moving & Storage moved families all over the world in 2015, and 94% of our clients said they would choose us for their next relocation. We also looked at trends among families we moved in our Washington DC moving company branch in Alexandria, VA. The most Northern Virginia families we moved interstate were relocating to the nearby states of the District of Columbia and Maryland. A large number of Northern Virginia families shipped up to Boston and moved to Massachusetts. One reason we moved so many NOVA families to the Bay State may be due to the location of our Boston branch. Many Northern Virginia families also looked to escape the cold by moving to California and Florida. Moving in Northern Virginia starts to pick up in April, peaking in June. Are you moving in 2016? Congratulations Boston, on surviving yet another Allston Christmas! In case you’re not familiar with this move-in day of massive proportions, 63% of Boston leases turn over on September 1st due to the thousands of students returning to university. The result is the biggest moving day in Boston, traffic jams of Uhauls, and sidewalks littered with belongings deemed not worthy of new apartments. Click here to learn more about September 1st Boston move in. 2015 was the year that Boston took the tradition to the next level. Social media and the press eagerly anticipated the horde of moving trucks and chaos, trending #AllstonChristmas on Twitter well before the 1st. Local residents made the day more festive with holiday-themed signage. Local companies also marketed the event more than ever, especially new neighborhood grocer bfresh market with a series of clever marketing stunts. The city of Boston also did their part to alleviate the gridlock by putting moving permit requests online and carefully monitoring Storrow Drive to prevent trucks from getting stuck under low pedestrian bridges. Whether it’s your first move or your fifth, having a helping hand in your move is always a good idea. So, what’s the deal with parking passes? The experts at Olympia Moving are here to tell you. Moving permits are super important and failing to get one can not only delay your move but also end up costing you in the end whether you’re working with a moving company or doing it yourself. In the past, Boston residents were required to schlep on down to the town hall and wait in a line with everyone else panicking about their own moving day. Sound like a blast? If you said no then we have GREAT news for you because starting this year you can get your parking permits from the comfort of your packed up living room! Why get a moving permit? Moving permits reserve spaces (standard size- 2 parking spaces) at a specific time and location to park a vehicle while moving your belongings in and out of your building, meaning no one else can park there during the times that you have paid for. If you do not get a parking pass you may not be able to park the moving truck near your home, which will add significant time and effort in moving your belongings. Another downside of not getting a moving permit is that you run the risk of getting a ticket or even worse being towed. Yikes. When and where do I get my permit? One day Boston moving permits can be ordered online through both the City of Boston and City of Cambridge website and are then mailed to you. These must be obtained at least two weeks but no longer than one month in advance to your move. Is your move closer than two weeks away? Don’t worry! You can still apply for a permit at City Hall. Keep in mind that metered spots also require a permit to park, so don’t take any chances. In addition to your moving permit, the city also requires “no parking” signs made of cardboard to be posted in the area with the date and times of their permit. 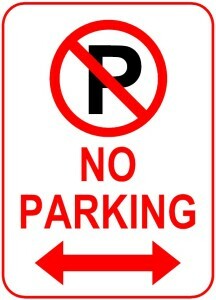 These signs must be purchased at a cost of $4.00 each with a minimum of two “No Parking” signs required. For metered spaces there is an additional payment of $20.00 per meter head per day, but don’t forget to supply the individual parking meter numbers when you’re applying. In Boston moving truck permits are a base fee of $61.00. For all other permits, the base fee is $20.00. In addition to the base fee, there’s also a fee of $1.00 per square foot calculated against the size of the occupied area. The square footage must cover the size of the truck and space needed to load/unload. So, a one day permit for a moving truck requiring two metered spaces would be approximately $80. This fee equals $61 (base fee) plus approximately $11 (40-feet x 8-feet x 1-day @ $1/sqft/month) plus $8 (two signs @ $4/sign). What do I do once I have my permit? Once you’ve received your permit and “no parking” signs you’ll have to post them within a minimum of two days before your moving date. This gives your neighbors time to coordinate where they will be parking their cars and will avoid the hassle of having to call the city to get a car moved. Still sounds like a pain? More good news! If you’re planning your move with Olympia we can do it for you! We’ll be sure to obtain the necessary permits specific to the area that you live in and eliminate the wait-time and stress of plastering your neighbor’s cars with notices. Plus, then you’ll have more time to pack and enjoy a glass of wine before the chaos ensues. Get started and request a free, no obligation estimate for your Boston move. If you are trying to declutter your home prior to a Washington, DC move, consider donating your old furniture instead of selling or trashing it. Not only is it better for the environment, but it is a chance to do some good. Donating furniture is easy with our list of organizations that offer furniture donation pickup in Washington DC, Northern Virginia, and Maryland. 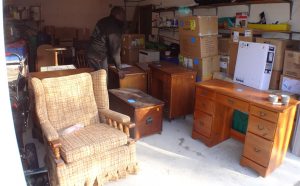 These Washington DC area organizations make it easy with furniture donation pickup. If you live in the greater Boston area, don’t miss our list of organizations that will pickup furniture donations in Boston. As proud supporters of Special Olympics Virginia, we recommend using Charity-Net to schedule a pickup of your gently used clothes, housewares, media, and furniture. Your items will go to Savers and Value Village Thrift Stores, and a portion of their sales will support the athletic programs and competitions for athletes with intellectual disabilities. You can book your pickup online. Just enter your zip code, and you’ll be presented with a list of possible pickup dates. This non-profit provides basic need items, education, and long-term support for those in need. They accept furniture, linens, baby items, and professional attire. All your donations will be used by someone in need within days! Fill out this form to schedule a pick up or you can drop off at their office in Silver Spring. Habitat for Humanity builds homes for people in need. Your donations got to their ReStores which raise money for the organization. They are in need of furniture, housewares, appliances, building supplies, and more. Fill out this online form to schedule a weekday pickup from your curb, driveway, or garage. You can also drop items at their Alexandria or Chantilly store Monday – Saturday. This non-profit is a collaboration of religious congregations in Alexandria, VA to provide a safety net for the needy in Alexandria. If you live in Alexandria, they will send a volunteer to pick up your furniture on Saturday mornings. Call 703-837-9300 x3 to schedule the pickup. Alive! also accepts housewares. This organization sells your donations and uses the funds for programs for veterans. Use their online form to schedule a pickup of your furniture, housewares, clothes, and more. Then just leave your items on your porch by 8 AM on your schedule pickup day. Still have leftover furniture? You can also check out this furniture disposal directory from Wayfair. Moving is the perfect opportunity to de-clutter your home. Rather than selling or tossing your unwanted furniture and household items, it’s even better to do some good and donate it. We put together a list of organizations that will do a furniture donation pickup in Boston and metro-west. You’ll read repeatedly that the easiest way to save money on a move is to move less stuff. This is especially relevant for interstate moves. The costs of the move are based on the actual weight of the move, so every pound you cut from your move will result in savings! So before you pack, think about whether you value that item enough to pay to move it. Also consider whether there is a place in your new home for your old furniture. Make a floorplan to ensure you know the new location of each piece. It’s also recommended to measure your furniture to check whether it will fit through the doorways or stairways of the new home. It’s expensive and frustrating for the crew to go through the effort of relocating a sofa only to discover that it’s not possible to move it into your new house. A new home is also a great opportunity for a new start. Maybe you’ve read the studies that less stuff equals more happiness and want to simplify. Or perhaps you want a new style for your new house, and some of your furniture and knickknacks just don’t fit with the new decor. This local organization provides furnishings for people who are transitioning out of homelessness into permanent homes. Olympia Moving has worked with this organization in the past as part of their furniture drive. The Mass Coalition will pick up the furniture from most towns around Boston, but their pick up truck can book up months in advance. Fill out this form to request a pick up and click here to see the items most needed at this time. The Salvation Army accepts donations of appliances, clothing, furniture, and household goods. Click here for a list of items they accept. There are donation drop off areas in almost every Boston-area town, click here to enter your zip code and find the one closes to you. If you’re donating furniture, call 1-800-SA-TRUCK to schedule a pickup. Household Goods is a local non-profit in Acton that helps people who need help rebuilding their lives, including fire or flood victims, domestic violence victims, veterans, refugees, and others. They accept donations of gently used furniture, kitchenware, linens, and household items. The drop off location is 530 Main Street, Acton on Tuesday, Thursday, and Saturday 9 AM to noon. They do furniture pickups at the same time for essential furniture and appliances only, click here to schedule a pickup. Society of St. Vincent de Paul is a locally organized Christian organization that helps the needy and suffering. Clothing donations can be dropped off at one of their thrift stores in metro-west Boston or you can call 1-800-675-2882 to find a nearby drop-off bin. To schedule a furniture pick up, call 1-800-675-2882, between 8:30am – 3:30pm (Monday – Friday). These Boston thrift stores raise money to fight aids. They accept furniture, media, houseware, kitchenware, linen, and electronics. You can drop off donations at their thrift stores or click here to schedule a furniture pickup. We’ve made it through yet another Allston Christmas – the infamous Boston moving day when 79% of rentals turn over. It was a very eventful September 1st for Olympia Moving as we finished busiest month to date. Our crews were in the midst of the Boston moving chaos, moving hundreds of clients in all the most hectic neighborhoods, including Allston and Brighton. According to Metro Boston, action from the city helped make this year’s Boston Moving Day a little smoother. The city issued 120 violations and 21 tickets for unsafe and unsanitary units, 1100 code enforcement tickets, 120 bed bug notices, and picked up 190 tons of trash. Mayor Walsh held a press conference on the scene about cracking down on the unsuitable conditions of many of the rentals that are the new homes of the moving residents. The Boston Globe perfectly encapsulated the moving madness in this video. BostInno theorizes that Allston Christmas could soon be a moving event of the past due to rising rental prices in Boston and Harvard’s expansion into Allston. However, the heatmap they posted via realtor Bryon Wells shows that the move-in volume is still strong. Buzzfeed explained September 1st in the language it knows best: funny gifs. Boston.com dug up some throwback photos from Allston Chrismas’s past, proving that some things never change. The Allston Xmas webseries also premiered their first episode yesterday, and they have 11 more to come. The first episode features a hilarious sofa moving scene that anyone who’s ever moved can relate to. Catch Olympia Moving in the credits, we gave them a hand with the sound mixing. We hope your September 1st move was a successful one! If not, remember that the easiest way to move during Allston Christmas is with Olympia Moving & Storage! “The movers did an absolutely terrific job. They were extremely professional and really took extreme care in everything they did. A perfect job completed during the busiest moving weekend of the year and a very hot one as well. Another Allston Christmas has come come and gone. The year, the infamous Boston moving weekend was even tougher due to high temperatures, rain, and humidity, but our Olympia crew managed to pull off successful moves for our clients! Some other relocating Boston residents did not have such an easy time. If you’re moving next September 1st, they say the best way to learn is from others’ mistakes & experiences. Here’s 19 things we learned from Allston Christmas 2013. 1. Double or triple parking will not help anyone.